Pro-life group Created Equal is holding its Road Trip for Life tour, visiting over 40 schools across the country to share the pro-life message. In a press release, the Created Equal team shared the news that they have faced an increase in violence toward both their property and their team members. One such incident took place at Indiana University in Bloomington, Indiana, and was caught on camera by Created Equal’s Field Captain, Samuel Riley. 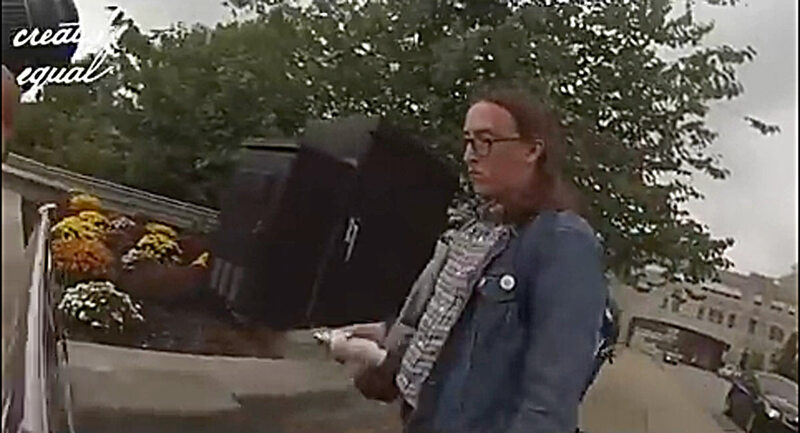 As the video begins, Riley is running down the sidewalk towards an Indiana University student, Thomas Metcalf, who has stolen Created Equal’s signs and is attempting to put them in his car while shouting, “F*** you” at Riley. Riley is able to retrieve the signs from the back of the vehicle and leaves the door open. A member of the university’s administration tells the perpetrator, “I’ll close it for you” and closes the door, allowing Metcalf to speed away. Violence, as well as a lack of knowledge about both abortion and the development of a preborn child seem to be common among pro-choice individuals who attack pro-lifers. After decades of being fed the lie that preborn children are “balls of tissue” or “clumps of cells” and that pro-lifers don’t care about women, it’s no wonder pro-choicers like this student are so enraged. Many of them are also post-abortive, and seeing pictures of aborted children may trigger deep and raw emotions. The abortion industry has been lying since day one, and learning the truth can be painful.